How to make a split-screen video? 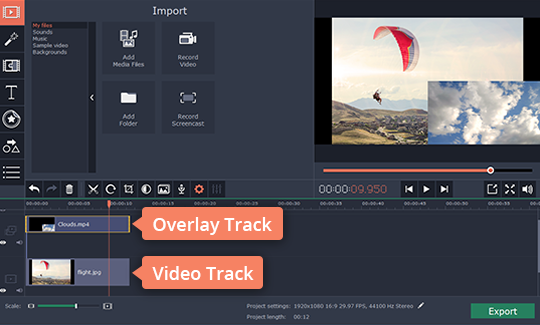 If you want to combine two videos on your monitor and create a stunning split-screen clip that will impress the viewers, you’ll need efficient video editing software. 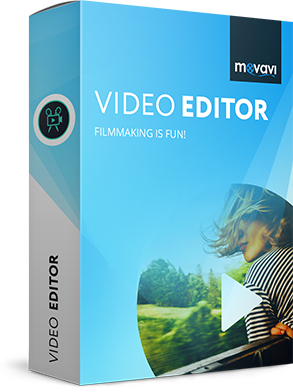 We recommend you Movavi Video Editor! 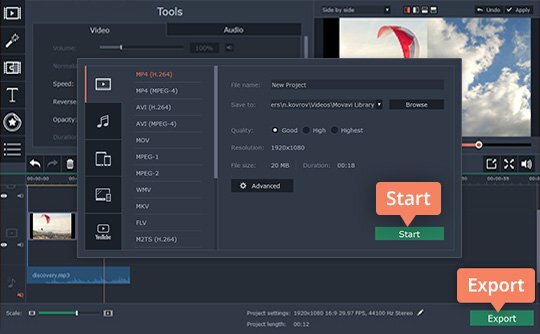 This easy-to-use app for Windows and Mac OS will help you to not only produce dramatic split-screen clips but also perform many other video editing tasks like adding music, applying transitions, and exporting video to different output formats. 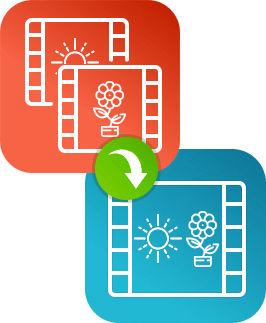 Download Movavi Video Editor and start creating your split-screen videos now! Creating the split-screen effect is easy, just follow the instructions and see for yourself! 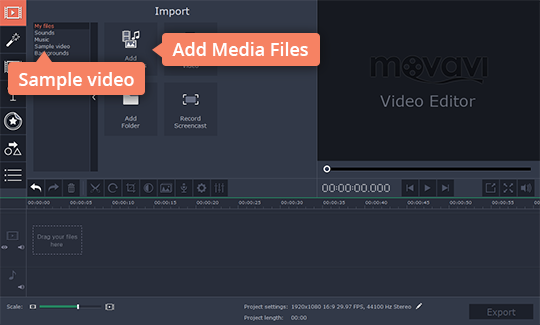 Download the Movavi Video Editor installation file and launch it. Once the setup is completed, the program will open automatically. As you've launched the program, choose Create project in full feature mode in the welcome window. Then click Add Media Files and locate the videos you want to combine. To make your video fancier, add some professionally directed footage from our partner’s stock video library. Select Sample video and click Download more! (or visit the Videoblocks page) to get more information about this option. By default, the chosen videos will be added to the Video Track on the Timeline in the lower part of the program window. First, select one of your videos and start dragging it up the Timeline – this will create an Overlay Track above the main Video Track. Drop the video onto the Overlay Track. 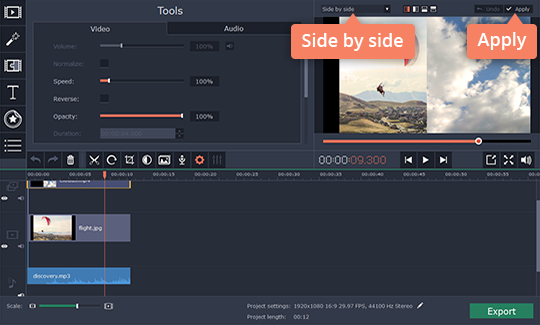 With our split-screen video editor, you can split a screen in half horizontally or vertically. To do this, double-click the video on the upper (overlay) track to enter editing mode. Open the list above the Preview window and choose Side by side. Click one of the four buttons next to the list to choose where the video from the main (lower) video track will play. The video from the overlay (upper) track will appear on the opposite side of the screen. For example, click the left button to play the main video on the left and the other video on the right side of the screen. When you’ve chosen the desired mode, click Apply. If you play your newly created split-screen video, you’ll hear the soundtracks of the clips you’ve added playing at the same time. It’s best to mute one of your videos to avoid deafening your audience! To do this, simply click the Mute Track icon on either the Video Track or Overlay Track. 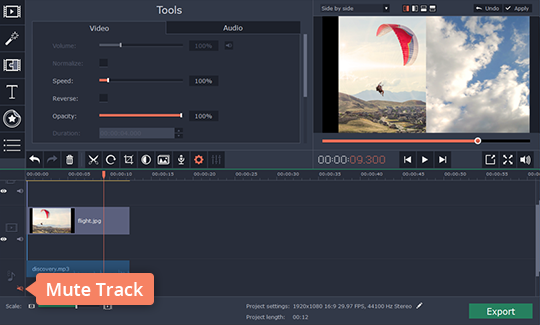 Now your side-by-side video is ready to wow your audience. Click the Export button and choose the appropriate format tab at the left side of the pop-up window. You can save the video for viewing on your computer or mobile device, or convert it for web export. After you’ve specified the saving parameters, click Start. It’s easy to create a split-screen video with Movavi Video Editor!